Dimensions 1 by 5.50 by 7.50 in. 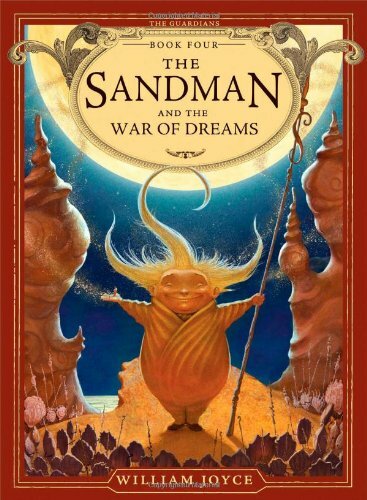 Amazon.com description: Product Description: In their fourth chapter book adventure, the Guardians recruit Sanderson ManSnoozy, the sleepy legend also known as the Sandman, to their cause. When the Man in the Moon brought together the Guardians, he warned them that they would face some terrible evils as they strove to protect the children of earth. But nothing could have prepared them for this: Pitch has disappeared and taken Katherine with him. And now the Guardians are not only down one member, but a young girl is missing. Fortunately, MiM knows just the man to join the team. Sanderson ManSnoozyÃ¢ÂÂknown in most circles as the SandmanÃ¢ÂÂmay be sleepy, but heÃ¢ÂÂs also stalwart and clever and has a precocious ability to utilize sand in myriad ways. If the other Guardians can just convince Sandy that good can triumph evil, that good dreams can banish nightmares, theyÃ¢ÂÂll have themselves quite a squad. But if they canÃ¢ÂÂtÃ¢ÂÂ¦they might never see Katherine again. About: In their fourth chapter book adventure, the Guardians recruit Sanderson ManSnoozy, the sleepy legend also known as the Sandman, to their cause.